As a busy mom and a coffee lover it would make sense for me to depend on pre-ground, flavored coffee for a convenient daily cup. Convenient coffee includes those nifty coffee pods, right? Well, yes, they are quick and easy, but I have never owned one of those coffee machines, nor do I desire to have one. See, flavorful coffee is a huge deal to me. Like wine lovers can pick out hints of various flavors in a good wine, I can taste the undertones and overtones of various flavor in my coffee. Drinking delicious coffee is more important to me than drinking conveniently-made coffee simply for the caffeine hit. If the coffee doesn’t taste good, it’s not worth it. That’s the main reason I grind my own coffee beans at home. Read on to find out how grinding your own coffee beans at home makes all the difference in the flavor of your coffee. Coffee is quite aromatic and full of flavor when it is first ground. 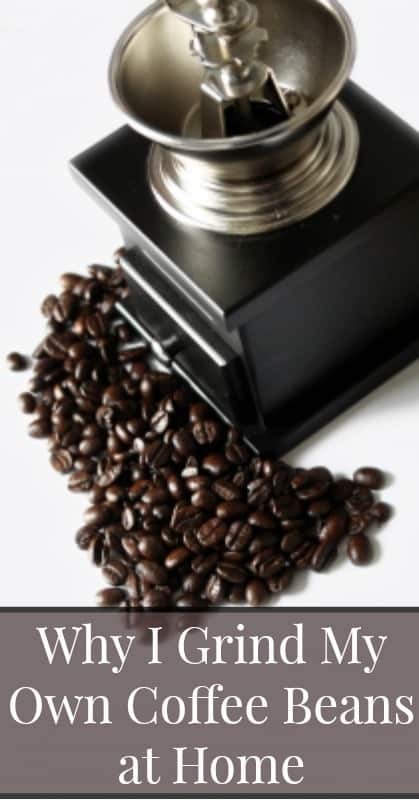 Even ten minutes after grinding, coffee begins to lose its flavor! Grinding coffee beans reduces their surface area, which causes the beans to lose their flavor more rapidly than they would if they were left as whole beans. When you grind coffee even moisture in the air can cause the flavorful, water soluble parts of the coffee bean to dissolve. In addition, oxidation, which occurs naturally, is sped up once the surface area of the coffee bean is reduce through grinding. Coffee that has been ground hundreds of miles from your home, stored who knows where for who knows how long, shipped to your local grocery, and then left to sit in a bag in your fridge or cabinet has been given plenty of time to lose its complex flavors. That’s okay if you are just drinking it for the caffeine hit, but if you really want a tasty cup-o-joe, you’ve got to be willing to do a little of the work yourself. For the sake of real flavor and your health, please skip the coffee whiteners and use real, full-fat milk or cream in your coffee. To sweeten your coffee, use coconut sugar, grade-B maple syrup, sucanat or your favorite whole, unrefined sweetener. If you like flavored coffees try adding vanilla, cinnamon, peppermint, cocoa powder or pumpkin pie spice to your coffee grounds. (Don’t add them directly to your cup of coffee because they can create an overwhelming flavor or an unpleasant texture. This beautiful copper burr coffee grinder has a classic design that will look amazing in your kitchen. This simple, automatic Cuisinart grinder has great reviews! This Ninja coffee grinder is small but mighty. I love that it works with my Ninja blender base. This JavaPress manual coffee grinder is sleek and great for small kitchens. If you’re looking for a coffeemaker that grinds the coffee beans for you, they exist but there aren’t many of them. This one gets the best reviews. If you’re going to go to the trouble of grinding your own coffee beans, please take the extra step of using a french press or pour-over pot to preserve the flavor of the coffee. A drip coffee machine might be a convenient must for your busy, before-work morning coffee, but the filter in a coffee machine absorbs a lot of the flavorful oils in the coffee grinds and steals the flavor. In addition, the water is usually far too hot and burns the delicate grinds, further damaging the flavor of the coffee. If you can’t get away from using a drip machine or even pre-ground coffee for your morning cup at least try to have a slow made cup of fresh ground, french press or pour over coffee on weekends or holidays. You won’t regret it.